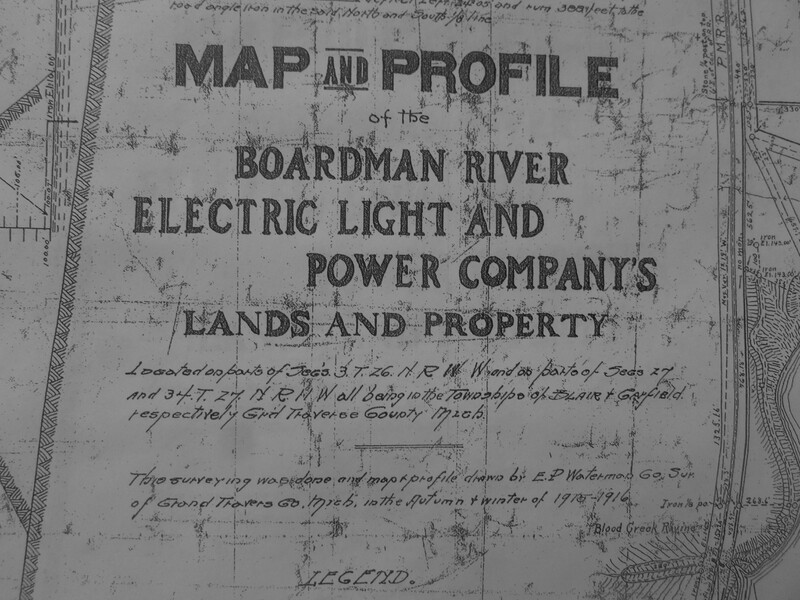 Partial image of Jack Robbin’s copy of a 1915-1916 map of the Boardman River property owned by the Boardman River Electric Light & Power Company. Boardman River Valley, November 2017. Image courtesy of the author. From the front window of his farmhouse Jack Robbins has borne witness to the lavish use of the Boardman River. The Robbins farm is in the Boardman Valley on Cass road near the site of the Boardman dam. Captain Harry Boardman first dammed the river for his mill before the turn of the last century, around 1847. Many subsequent dams have either washed out or been removed. 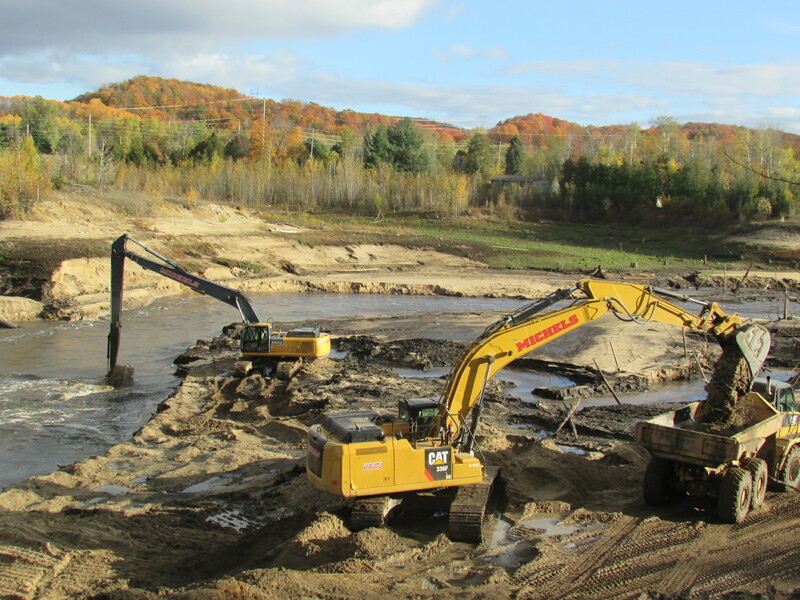 The most recent dam removal is almost complete and is restoring the river to its natural state. 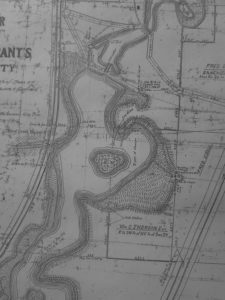 The river restoration effort was aided by a historic map that Mr. Robbins had tucked away in his farmhouse. The map took two years to make (1915-1916) and was drawn on a special fabric by surveyor E.P. Waterman. 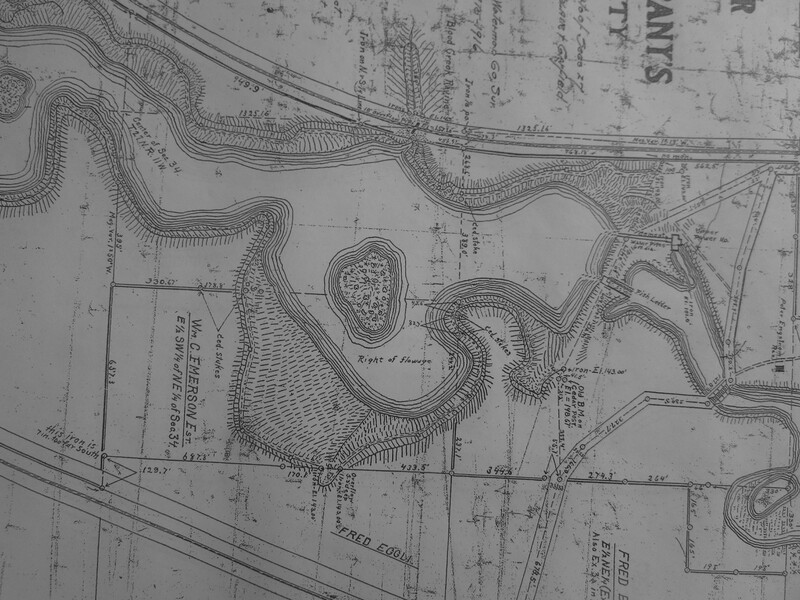 The detail on the large map includes the location and elevation of bench marks that assisted in the removal of the original dam built in 1894. The Sabin dam is also included on the map. Over one hundred years later Mr. Robbins shared the map with the Army Corps of Engineers Manager Alec Higgins (2). The map was used to locate the historic channel of the Boardman River while the 1931 dam was removed this year. Jack Robbins bought his farm in 1951 and fished the deep holes above the Boardman dam until October 1961 when the Keystone dam washed out and filled in the holes with sediment. He showed me the location of the original Boardman River Electric Light and Power dam from his front window. His map reveals the points of interest such as the grade of a carriage road that lead to a wooden bridge just across from his farm. 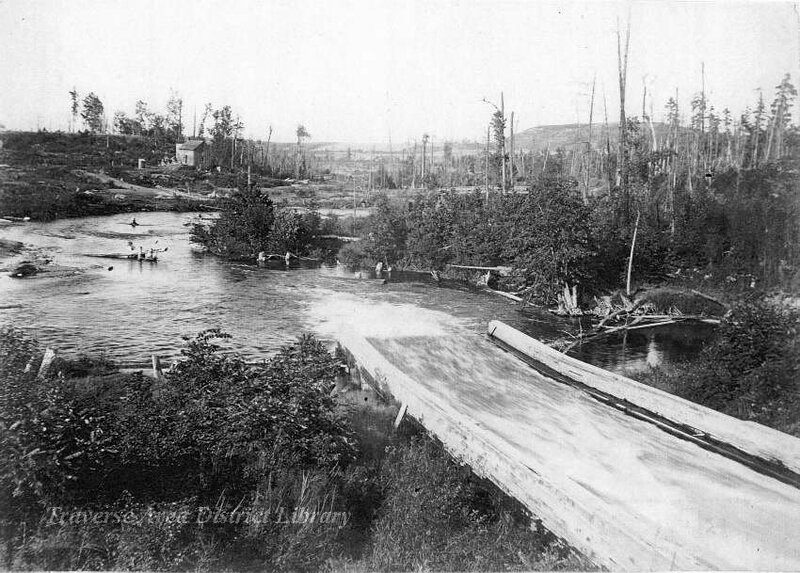 Photographic postcard of Boardman River Light & Power Plant Dam under construction, 1894. Image from the Local History Collection, Traverse Area District Library. 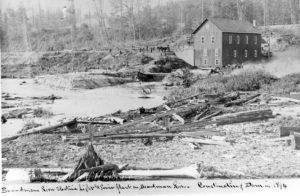 In November 1894 Boardman River Electric Light and Power completed construction of its first dam and turned on the electricity. This original dam was just downstream and twenty feet lower than the Boardman dam that was just removed. 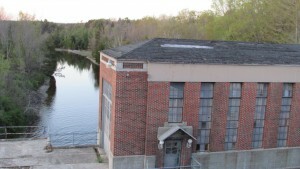 The powerhouse was right across the road from the Robbins farm. 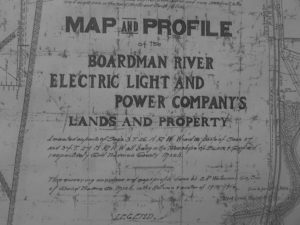 Boardman River Electric Light and Power Company. 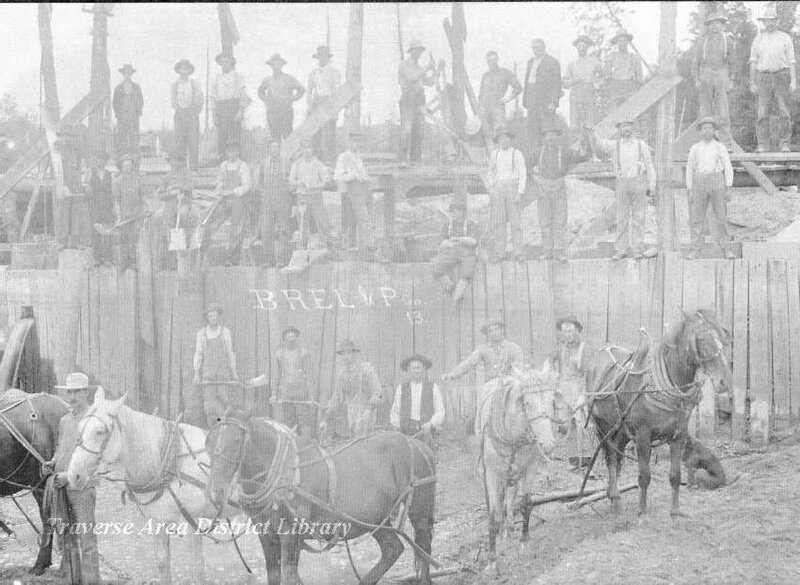 Crew working on the Cass Street dam, 1903. The dam on Swainston Creek washed out in 1961. That large slug of floodwater washed out the Keystone dam during a rainstorm. Jack Robbins remembers this event well and has stories to tell about how the dam operators attempted to avoid disaster. Boardman River Valley. Image courtesy of the author, November 2017. River restoration is an art and a science. River restoration is taking place in watersheds across the country and represents a change in the “new gospel”. It would be approved by Bruce Catton. 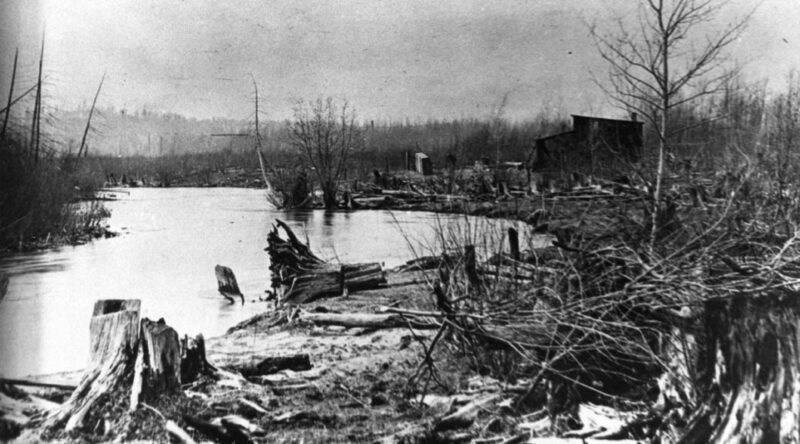 Mr. Robbins is well aware of the environmental destruction that has taken place in the Boardman Valley which began in the logging era, and he approves of the Boardman River restoration project. Catton, Bruce. 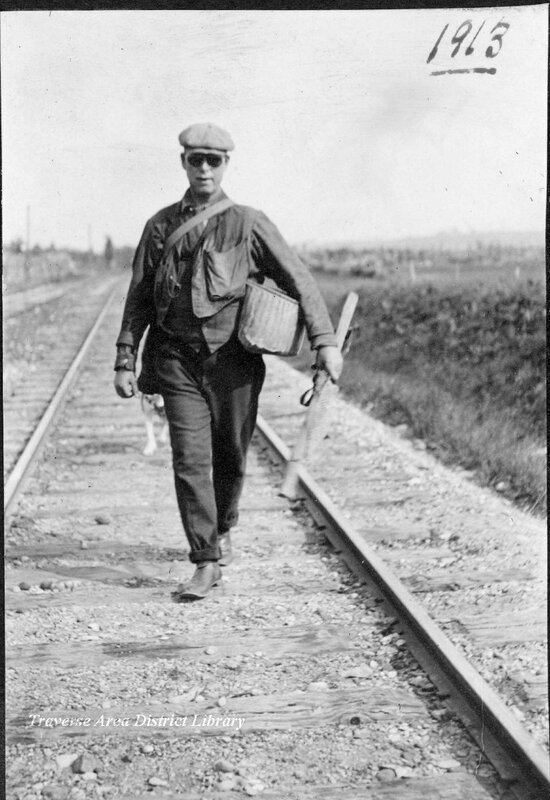 Waiting for the Morning Train: An American Boyhood. Higgins, Alec. Email interview with the author. Grand Traverse County Historical Society. Currents of the Boardman. Ferris Glass at the Brown Bridge Dam, prior to demolition in 2012. Image provided by Mr. Glass. Ferris Glass was four years old in 1924 when his family moved into the house on the bank next to the Brown Bridge dam. 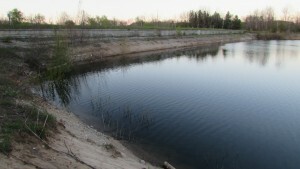 The earthen dam had just been built to provide electric power for Traverse City, its backwaters forming Brown Bridge pond. 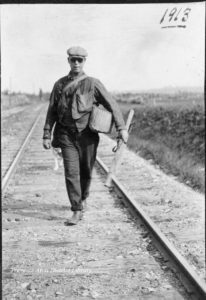 His father was employed by the City of Traverse City to operate the dam, a job that was not without risk: Just ten years before, a dam operator in Mayfield had drowned when the earthen dam had washed out after a heavy rain. Twenty-four years before that, the earthen dam above Johnstown Pennsylvania had been swept away, killing 2,209, a record number of deaths for a weather-related event in the United States at the time. Image provided by the author, May 2016. I recently talked with Mr. Glass at his home in East Bay Township. Judging from the piles of newspaper clippings on his kitchen table, he has been following developments on the Boardman River ever since the early days. 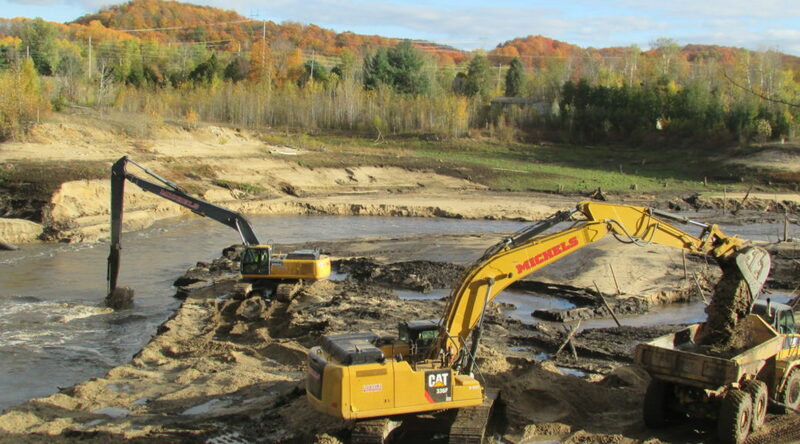 The most recent flurry of activity, the washout associated with the removal of the Brown Bridge dam, has been of particular interest to Mr. Glass. The current removal of the earthen dam on Cass Road (known as the Boardman Dam) has not escaped his notice, either. 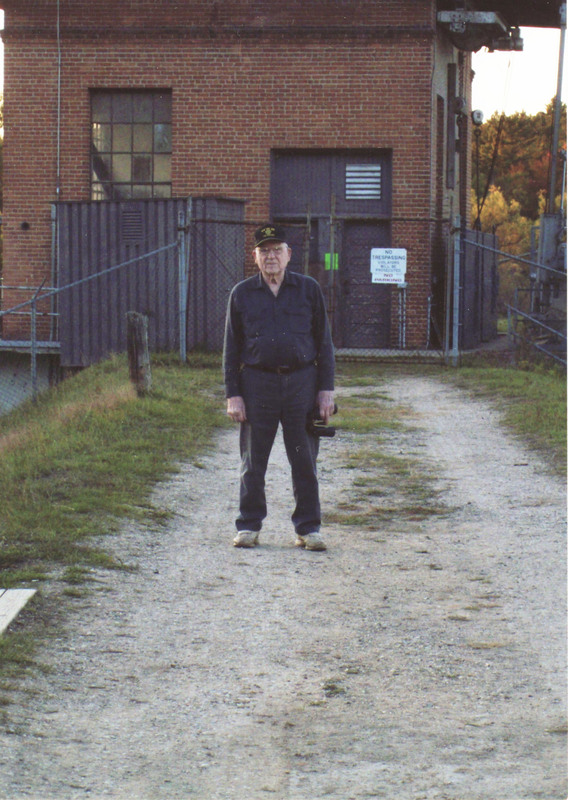 His memories of the early years tell us of the duties of a dam operator. One of them was to watch the big dial on the wall of the powerhouse that indicated electrical output. Ferris helped his dad make sure the one hand on the dial pointed up, that signaling optimum current flow. After a heavy rain, the Brown Bridge Pond rose, allowing more water to enter the spillway, causing the generators to turn faster. With dry weather, the pond fell, slowing the generators. By opening or closing the water gates, the operator could rectify the electric power and keep all of Traverse City’s electric clocks on time. 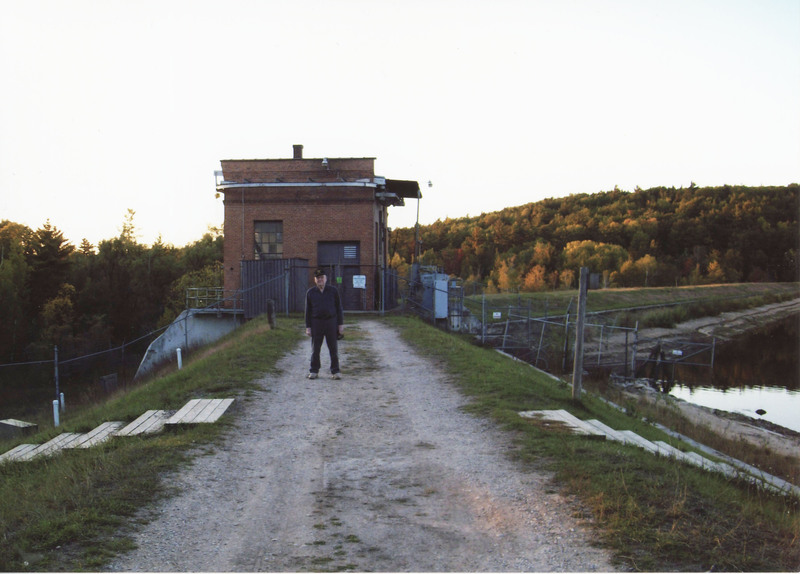 For his childhood and beyond, the Brown Bridge dam was Ferris’s playground. He climbed all over the powerhouse and helped his dad when logs floated down and struck the dam. At the time the Brown Bridge dam was built, the powerhouse had two electric generators. Later, when he was fifteen, Ferris watched as a new water wheel was installed. The new design increased the amount of power generated, but even with that increase, the Brown Bridge dam could not keep up with demand. Early in 1866, George Neal and Lucas Knight built a dam across the Mayfield Creek, its waterpower first used for sawing wood and grinding grain for flour. 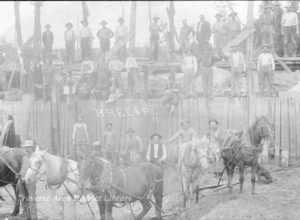 In keeping with the times, J.D.Gibbs converted it to a hydroelectric plant at a later date, but its future was short and catastrophic as it washed out in 1913, killing dam operator John Hawthorne. On August 24, 1898 the Boardman River Electric Light & Power Co. dam (now called the Boardman dam at Cass Road) gave way, the subsequent flood sweeping downstream, carrying everything before it. The same rain event triggered enormous damage to private property in Traverse City along the flat through which Mill creek (now called Kids Creek) in the vicinity of North Cedar Street. According to the Morning Record, the residence of Fred Schrader was completely flooded, his family forced to escape through a second story in a boat. Boardman River near Boardman Dam, after drawdown activities, May 2016. Image provided by the author. Since the Keystone dam was downstream of the Brown Bridge dam, water levels in the Keystone pond would get low, and the operator of the Keystone Dam would call Ferris’s father to release water from the Brown Bridge pond to fill the Keystone impoundment. It took seven hours for the surge to travel from Brown Bridge Dam through the river to reach Keystone pond. As the Keystone pond rose, the operator could resume producing electric power at normal levels. The dependence of one dam upon another explains sequential washouts under heavy rains. 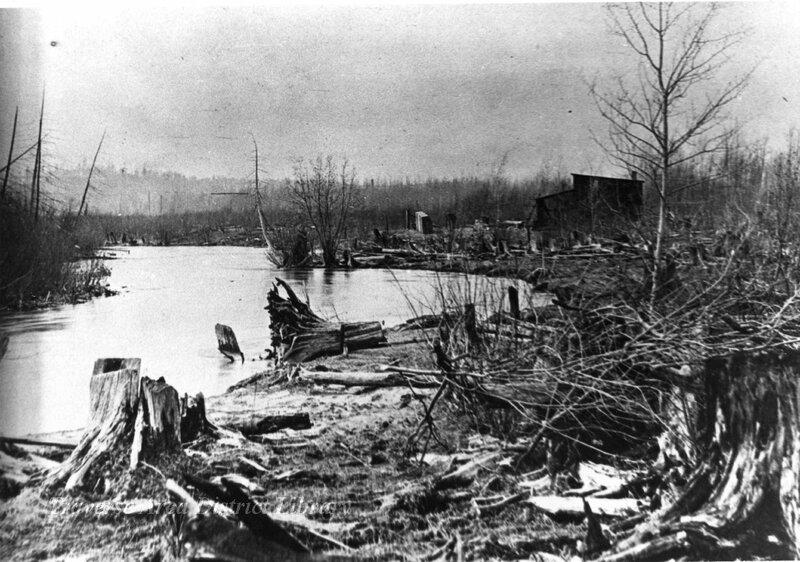 First, Mayfield creek washed out in a 1961 rainstorm, that washout on the east end of the earthen dam at Mayfield adding to flood waters of the Boardman River and triggering the Keystone dam failure. The community fearing another washout, Elmer’s construction company was contracted to stabilize the earthen dam in Mayfield Park in 1987. 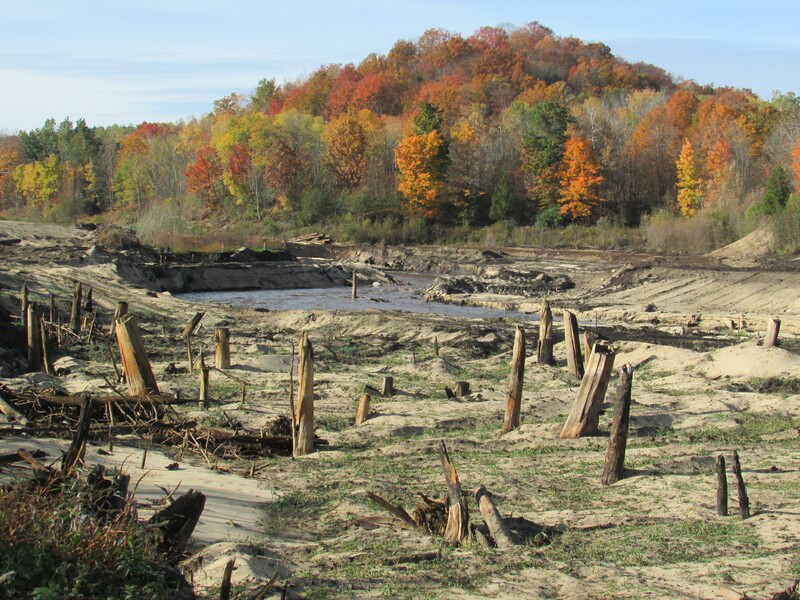 There are 80 earthen dams in the Muskegon River watershed, two of them creating Houghton and Higgins Lakes. In September of 1986 fourteen inches of rain fell within a forty-eight hour period, the deluge swelling the Muskegon River to eleven times its average flow. Operators of the earthen Hardy dam sounded the alarm on September 11th as water washed over the top of the earthen dam and sand squirted out the seams on the concrete spillway. 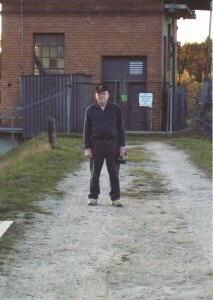 Operator Charles Smith worried that the emergency spillway at the Hardy dam would fail. If it did, a wall of water would rush down the river and destroy Croton dam downstream on the Muskegon. If that had happened, river communities in Newaygo County would have been wiped out and the level of Muskegon Lake would have risen by twenty-two feet (Alexander, The Muskegon). 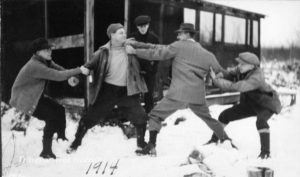 As with the Mayfield and Keystone dams, one failure leads to the next. Earthen dyke for river at Boardman Dam, above where the new bridge is being constructed, May 2016. Image provided by the author. The flood that wiped out Johnstown and killed 2,209 people taught dam builders important lessons. One of them was the importance of a core wall, a sturdy concrete or rock center to the structure. Proving that Brown Bridge followed modern dam construction specifications, Ferris Glass can show pictures of the core wall that stabilized the Brown Bridge dam as it was being built in 1921. There was no loss of life when Brown Bridge dam was removed in 2012—or, for that matter, during the entire 92 years it held back the waters of the Boardman River. 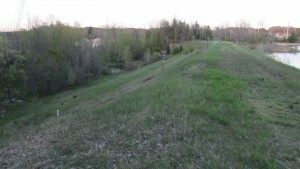 The normal headwater elevation of the Brown Bridge Reservoir was 796.7 feet, about two hundred feet above the Grand Traverse Bay. By contrast, the dam above Johnstown PA was almost five hundred feet above the town. Watchful dam operators like Ferris Glass’s father explain why washouts of earthen dams on the Boardman above Traverse City did not cause more destruction, though the gentler topography of Northern Michigan may have had more to do with it. As we were talking, Glass repeated several times that the Army Corps of Engineers is afraid of earthen dams, that fear perhaps deriving from the disaster at Johnstown and elsewhere. That is another lesson of Johnstown: Dams are a danger if poorly maintained. That is why the Corps required dams all across the state to be inspected on a regular basis. Based on those inspections, action must be taken to improve deficiencies discovered in the dam–or else it must be removed. 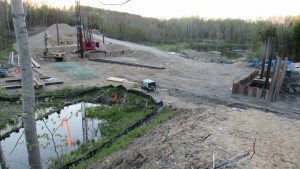 Construction of new bridge at Boardman Dam, directly below the dyke. 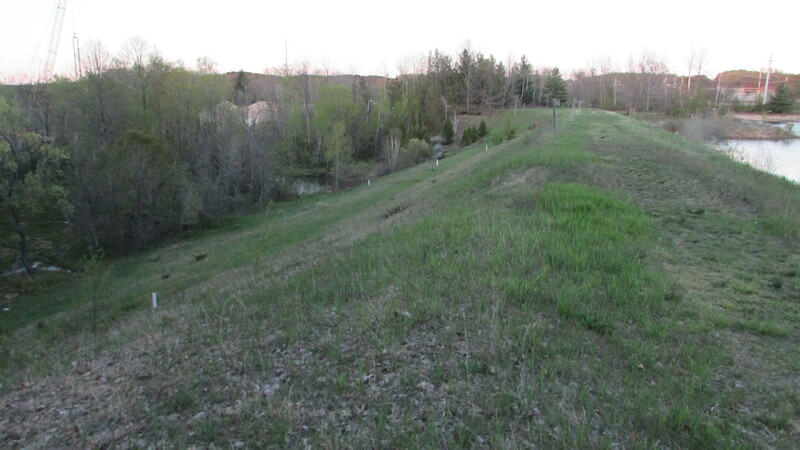 We believe the channel pictured left is where the river used to flow (the historic channel, before the pond was impounded), May 2016. Image provided by the author. When Ferris Glass was asked how he felt about the removal of the Brown Bridge Dam he said: “I hated to see it go, but I can understand why [they did it]. It came down to a decision based on money–the cost of repairing the dam could not be offset by the power generated. Back in the 1920s and 30s the power from the Brown Bridge Dam did not meet the demand. Since then the demand for electric power has grown so that the power from the dam on the Boardman River would be just “a drop in the bucket,” “not enough to run the mall.” However, like many residents, Ferris Glass hated to see the Brown Bridge dam go: he saw it as a successful community project that not only produced electric power but also added a beautiful lake for people to enjoy. Alexander, Jeff. The Muskegon. Michigan State University Press. Brown Bridge Dam – Temporary Dewatering Structure, Root Cause Analysis of the October 6, 2012, Failure Incident. Michigan Department of Environmental Quality. McCullough, David. 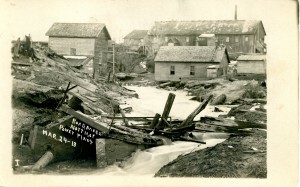 The Johnstown Flood. Simon and Schuster. Williams, A.V, editor. Currents of the Boardman. Grand Traverse Historical Society.